If you have already made up your mind to go ahead with that much needed kitchen remodel, whether it is because you simply want an updated look, or just staging it for a possible sale; let's face it, the cost could be out of this world for the budget minded. Nevertheless, there are ways to meet and even exceed a thrifty remodeling budget without sacrificing the great look you crave. 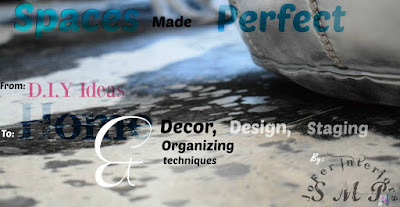 In this short tutorial we will discuss a simple and budget friendly way on How To Refinish Stainless Steel Appliances without having to dig too deep into your piggy bank. For starters let us begin by saying that there is no such thing as "stainless steel" per say. Steel is an element that when exposed to the natural elements in the environment (air,water etc) will cause steel to change its natural condition causing it to rust. With this been said there are other elements that are added to stainless steel appliances that will aid in the prevention and or retardation of this behavior. Among these protective elements, we have chromium. The higher the concentration of this layer on the appliance, the greater the rust prevention of the steel. This is where cost and quality of the appliance comes into play. A budget friendly and cost effective stainless steel appliance will tend to have less of these protective layers and or elements compared to the more expensive choices, hence leading to an undesirable looking appliance as time progresses. Another thing to bare in mind is that one of steels main component is Iron and Carbon elements. We all know how iron can rust as fast as it takes us to say its name. Also exposing the appliance to very high temperatures and extreme variances in these temperatures can easily exasperate the process. A stainless steel refrigerator or freezer for example near to an stove oven can help increase its chances of corrosion. If you are remodeling your kitchen space our recommendation if feasible, will be to place the appliance at a considerable distance from the stove/oven. If the cost of doing so does not hinder your budget plans, then you may well be able to opt for that less expensive stainless steel refrigerator freezer. 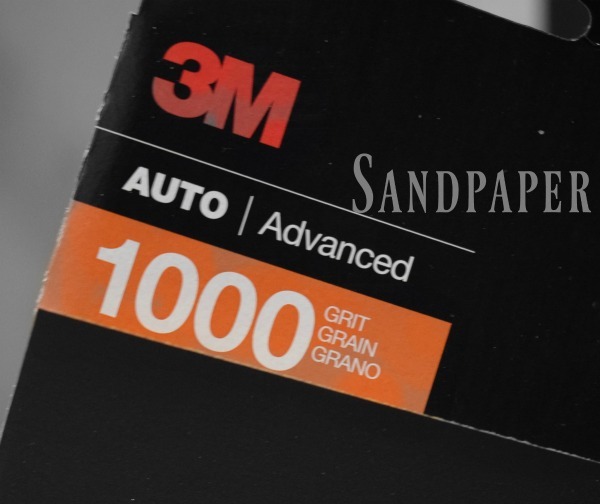 We used the Very...very fine grit sandpaper to complete this task. 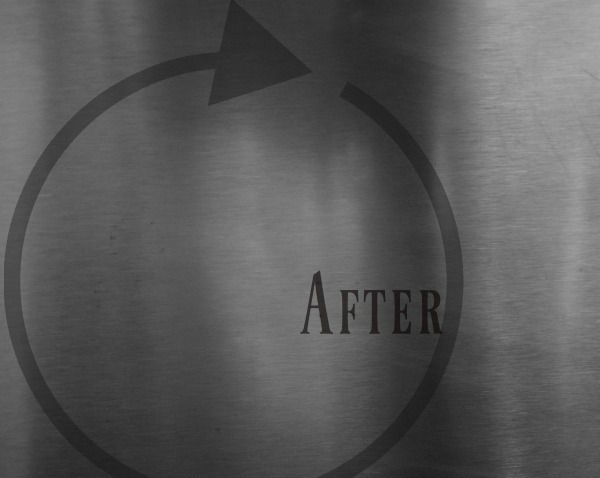 It's important to choose a fine grit considering that you do not want to leave huge scratch mark on your appliance. Warm soapy water is also needed in order to saturate the sandpaper. by wetting the paper in will not only prevent dust particles from taking flight, but it will also allow for a much smoother even finish. Note: When sanding do not press hard against the object and move from side to side using even strokes. If you look closely at the stainless steel sheet and or alloy that envelopes your appliance, you will notice the path of the grain. (This will usually be a horizontal path). 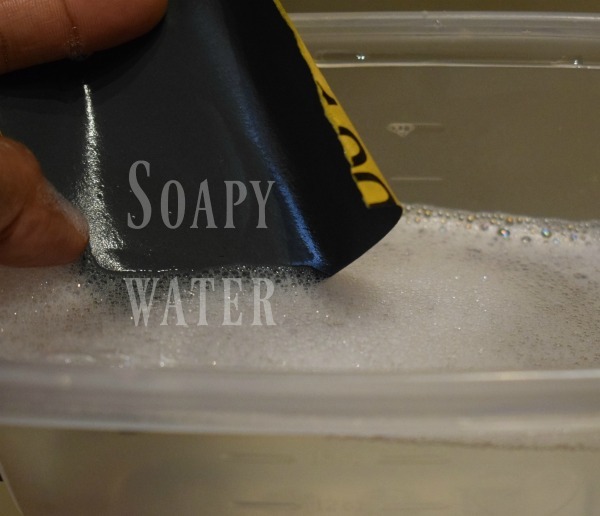 Always make sure the sandpaper is saturated with the soapy water. Sanding will also results in a semi dull appearance, hence requiring the use of a carrier oil as you will see below. 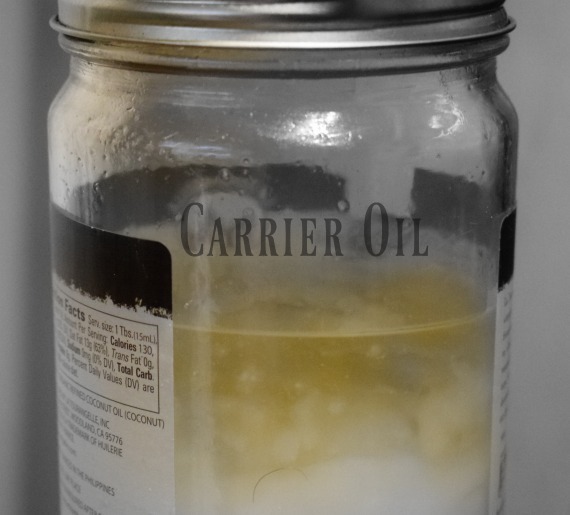 A carrier oil is used to bring back the luster of the steel. In this case refined coconut oil. 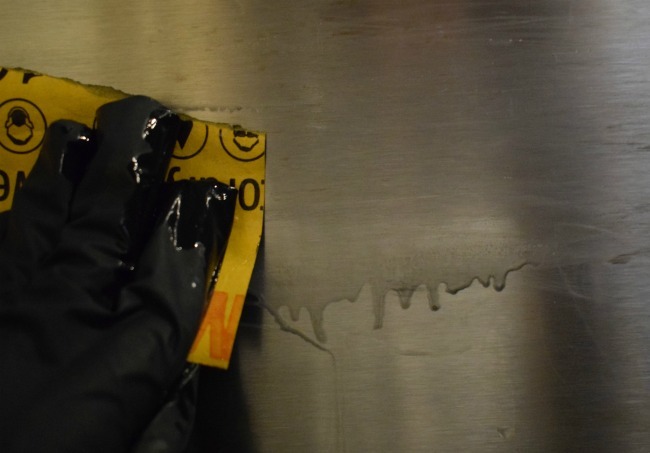 (refined oils will tend to be completely odorless). The best option for this though would be to use mineral oil, but considering there wasn't any handy at the time we opted for the next best alternative. Above is a after image of the completed project. After applying the carrier oil and buffing the appliance using a clean rag, it brought back the natural sheen of the metal. 98% of the oxidation was removed leaving once again an appealing kitchen appliance worthy of remaining in the remodeled space.